Amethyst is the last gemstone listed in the third row of the High Priest's breastplate (Exodus 28:19 and 39:12). The Bible word itself is derived from the Hebrew word achlamah (Strong's Concordance #H306) and means "dream stone" according to Strong's Exhaustive Concordance. The BDB states the word likely refers to a purple stone. It also translates achlamah as amethyst just like Strong's. Additionally, in all major Bible versions used for comparison purpose in this series, the word achlamah is translated "amethyst" with the NLT adding that it was the color purple. The twelfth foundation gemstone used in the New Jerusalem (Revelation 21:20) is called in the Greek amethustos (Strong's #G271), which is used only in this verse in the entire New Testament. It means a rock that is believed to prevent intoxication or make someone "not drunk." Strong's translates this word as "amethyst" and Thayer's lexicon states the word refers to an amethyst that has both a violet and purple color. All ten Bibles used in this series also translate this Greek word as this precious stone. Who was the High Priest in Jesus time? Is it a sin to wear a cross? Why was New Testament written in Greek? Amethyst is a variety of quartz that is violet (purple) colored. It was highly prized by the ancient Egyptians. Anciently, it was believed that any intoxicating liquid drunk from a cup composed of amethyst would render the drink unable to cause someone to be drunk. Amulets made of the rock were also worn to counteract the effects of wine. In the Middle Ages, the amethyst was considered a pious gem and used by the Church. In the fifteenth century, amethyst was believed to control evil thoughts, make a person generally smarter and give them the ability to be a shrewd in business. It also, according to legend, gave soldiers the ability not to be harmed in battle and be victorious over their enemies. 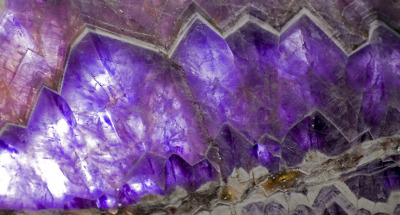 Amethyst was also believed to aid those in capturing wild animals (Curious Lore of Precious Stones, page 58). Whose dreams are in the Bible?